Fan the smoke with your feather fan and continue to fan the embers as needed to keep them going. In some traditions it is believed that it is disrespectful to blow upon the smudge with one’s breath. This is why using a feather fan is more effective and respectful. 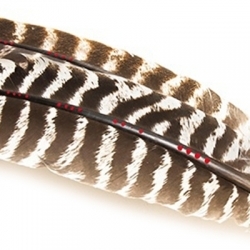 Feather fans help in the smudging process and have the effect of combing the human aura, therefore adding to the cleansing and restoring balance. Feather Fans used for smudging in a ceremony not only look beautiful but also add the qualities and medicine of the birds which they came from. Happy Smudging! Smudge Fans There are 8 products.